I (mistakenly) thought I heard the strains of a Christmas song this morning coming from the radio in another room and after clarifying that it was definitely NOT a Christmas song it made me think about a couple of things. First, Christmas in July. I know it’s coming up and I really don’t get it. Is it an ode to Christmas decorations? A reason to not have to take them down after the real season is over? A clever way for retailers to put a hand back in our pockets with a random July sale? Yes, we are at the halfway point between last Christmas and this upcoming Christmas, this is really no reason to celebrate. I am sure there are some folks who are still paying for last Christmas. So anyway, please do not mistake this for a Christmas in July message. It is only coincidental because my hearing is apparently going bad. The real thought that stuck was the idea of Emmanuel, God with us. We talk a lot about this at Christmas, Jesus coming down to our level, inserting Himself into our mess, so that He could be with us. But this is an ideas that we need to hold onto today, just as much as in December. With us, in all of our chaos, and in the quiet. With us, when we are struggling and when we are celebrating. 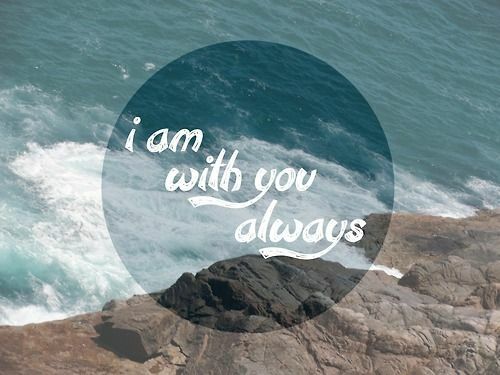 With us, whether we notice His presence or not. Emmanuel, God with us. Invite God into the crazy, into the chaos, into the fun. This is where something beautiful begins to happen…not just God with us…us with God. When we include Him, weave Him into the fabric of our everyday life. I have found that with God’s calming presence, the overbooked and overstretched doesn’t have to result in a “snap.” Sometimes in our family we do get wound a little too tight which means we get to practice forgiveness (both giving and receiving.) We can use our failures as teachable moments for grace and mercy and humility. This is where faith intersects with life, where God gets taken off His Sunday shelf, and invited into the present. God with us…us with God. More than ever, I have a desire to do more than just manage my days. I want to experience life. I want to open my heart up to be present in today, not bulldoze through it in anticipation of tomorrow, or next week. I want to make this very moment count. I want to allow my soul to awaken to the thrills of the Lord’s presence as I move through every crazy day. I love Jacob’s words in Genesis, “Surely the Lord is in this place, and I wasn’t even aware of it!” These words echo in my heart as a reminder to take a deep breath in the chaos and notice Emmanuel, God with us. It’s not just for Christmas!